Now anyone can have a fully functional and beautiful set of teeth. Implants can be inserted with minimal risks once the patient’s jaws have stopped growing (between 14 and 18 years of age). Tooth implantation is also possible when conventional methods to replace a lost tooth have failed. and affix a bridge to those. may last for a lifetime. several missing teeth make the patient’s cheeks sag (facial contours change). 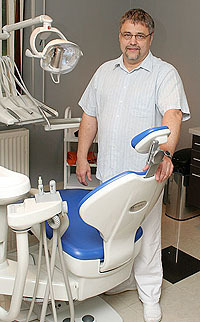 In this case, the conventional solution is a removable set of false teeth. One variation of implantation involves the insertion of three separate implants. The other option is to place a bridge on two fixed implants; this is a more convenient and longer-lasting solution than a removable denture. There is no need to damage (chisel) healthy teeth next to the empty socket. With good oral hygiene, implants can last a lifetime. Thanks to the latest local anaesthesiology and dental technology, the operation is entirely painless. Implanted new teeth can be used just like your own teeth. They can be cleaned just like real teeth, unlike a removable denture. In fact, there is still hope if your have long lost your teeth, as atrophied bone tissues can be grafted.